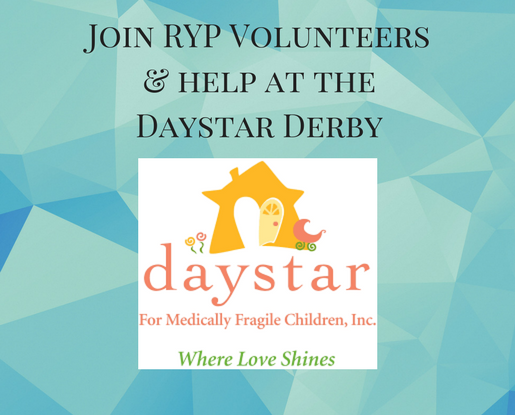 RYP Volunteers: 12th Annual Daystar Derby | Rochester Young Professionals, Inc.
Join RYP Volunteers at the 12th Annual Daystar Derby on Saturday, May 5th at Monroe Golf Club. Volunteers have two opportunities to be engaged with this event, we look forward to your participation! In the morning 9-11AM for event set-up and evening 2-7PM to assist guests with registration, auction bidding and checkout. There are volunteer training opportunities as well as t-shirts provided for day-of wear. Registration has closed. All RYP members who completed the volunteer form will hear from the agency directly for training and day-of responsibilities. The Daystar Derby is Daystar’s largest fundraiser, raising critical funds for those with special healthcare needs who are not funded. Daystar’s pioneering work to support children coping with serious medical and developmental complexities and their families is an innovative best practices model for replication, effectively bridging the gap from inpatient care until children successfully transition into school-based services.